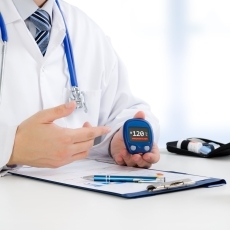 Diabetes: Is a life-long disease characterized by high levels of sugar in the blood. It can be caused by too little insulin (a hormone produced by the pancreas to regulate blood sugar), a resistance to insulin, or both. Insulin is a hormone produced by the pancreas that helps glucose to enter all the cells of the body. Type 1 diabetes occurs when the body doesn’t produce any insulin. Without insulin, the body is unable to use glucose for energy. Type 2 diabetes is the most common form of diabetes mellitus. About 95% of people diagnosed with diabetes have Type 2 diabetes. In Type 2 diabetes, the body produces insulin, but it doesn’t produce enough or the cells do not use the insulin. Type 2 Diabetes is a chronic condition that is best prevented and treated through diet and exercise. It is defined by high levels of glucose in your blood stream. There is no cure for the disease but through diet, exercise, and maintaining a healthy lifestyle you can often manage your diabetes without taking any prescription medications. However, medications may be prescribed by a doctor if natural lifestyle changes do not work. If you experience these symptoms, you should get tested to see if you have or are at risk for Type 2 Diabetes. Blood glucose tests are readily available and free at many community health promotion and preventative health events. EDTA chelation therapy “grabs” a number of unwanted substances that can cause LDL Cholesterol plaque buildup and free radical damage from the cardiovascular system, renders them harmless, and prepares them for excretion through the urine. Oral Chelation Therapy is a natural process of roto-rootering the cardiovascular system, helping the body cleanse the arteries and veins, as well as detoxify the liver and kidneys. More on Diabetes and Chelation Therapy in the next post.